Program Notes/Description: Inner thoughts screaming to be free yet held in complete silence. Jordan: I grew up in Arizona and I attended my mom’s dance studio my whole life. After school, I ended up at Marymount, Manhattan for a year in New York and then I heard about Arts Umbrella and decided to audition because I really liked what Arts Umbrella valued and here I am in second year now — it’s crazy how fast it went. It’s been a really beautiful ride, though. Sophia: I began dancing as a little kid, and I did all my training at the Goh Ballet. I came to Arts Umbrella in October of my Grade 12 year, when I met a woman who introduced me to Artemis [Gordon] and I knew the moment I met Arty that I needed to be here. Now we’re in second-year grad and it feels like I’ve been at Arts Umbrella my entire life, because I feel like I’ve learned more about who I am my two and a half years at Arts Umbrella than I have in my 19 years of life. Tell us about your piece and your process: What inspired you? What would you like audiences to take away from your work? Jordan: We both had similar experience — both of our moms were sick with breast cancer a year or two ago, and they’re in remission now. But we were talking about that idea that everyone has their own struggles, whether there is something physical or in their heads, that we all go through, and we often don’t realize that other people are also going through similar things — how we can almost be blind to the fact that everybody is always going through something. That’s what we’ve been branching off of. We started with writing. We got everyone to pair up with a partner and they all wrote about something — we left it completely up to them — super broad or super specific, it didn’t really matter, and we started our movement simply based off of their text. We found a piece of music that we both thought was really inspiring for us and took it from there, because working from text created a lot of movement and a lot of inspiration. Did any other elements, such as music, influence or inspire your work? Jordan: The music we found is kind of repetitive, but also builds and fades out at the end, which felt right. Sophia: We’re working with a lot of voices, as well. Originally, we wanted the dancers to speak during the piece. We tried having them speak what they wrote and we also are working with some voice-overs in the music because we think it might be more powerful. Jordan: We’re still working on the music aspect and we don’t know if we’re going to include that yet. 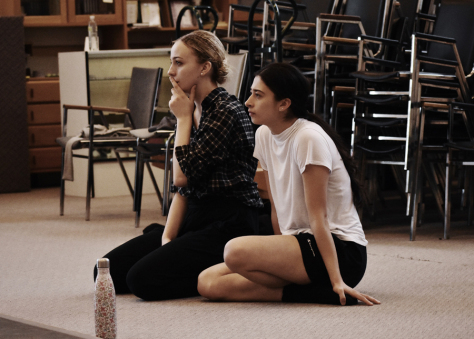 Sophia: There’s a lot of different stories in the piece, and a lot of different struggles that I think will be perceived pretty clearly, and then we wanted a big group because it’s this idea of something quite universal. What are you most looking forward to about the final performance of your piece? Jordan: I’m just excited to see the dancers and what they are going to bring to it. Already watching them today was quite emotional. Sophia: I think we’re just really proud and excited to share it with everyone. Jordan: And it’s also nice for all of us to have this opportunity to work with each other and do what we want to do. We do so much of trying to do what we need to do, but with this, we don’t have to try, we’re just doing it. Sophia: And just seeing sneak peeks of what other people are doing has got me kind of emotional — the pieces are all so different. Jordan: They are all so different. 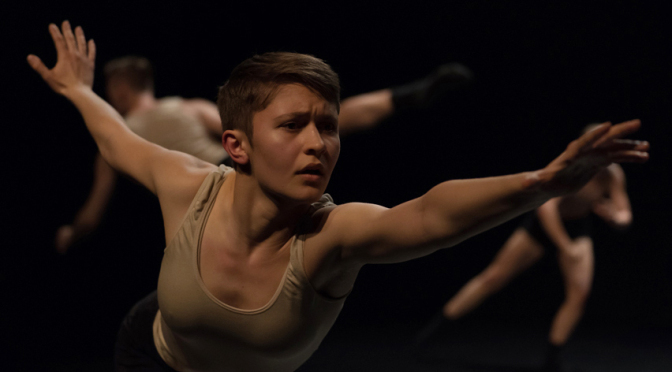 What was the most influential thing you learned from working with Crystal Pite? Jordan: I don’t even know how to say it. She is so willing and generous to give whatever she can, and not only does she give whatever she can, she questions a lot, which is what we were just talking about with our shadow, Katrin. Sophia: We wanted a shadow, Katrin, who was also in the piece. She helps us a lot with the choreography, but also because she’s in the piece we get a feel for what it’s like [from the] inside. Jordan: We were talking about how Crystal doesn’t give us the answers, but she questions. That opens things up. Sophia: She gives us new things to think about, and that gives us what we need. She never answers us with “yes” or “no”, she’ll give us a new thought, or new way of looking at it.